This gorgeous “Blue Point Himalayan Cat” cat stood proud after grooming. The beautiful fur and face of this cat was mesmerizing. The regal pose and the slight turn of his face catches your eye and brings you into the painting. My client came to me after Madison Blue had passed and gave me tons of pictures to refer to. 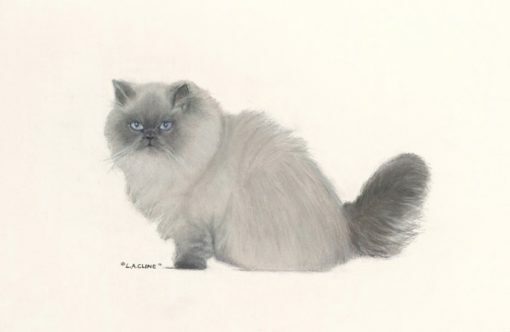 I immediately looks up the breed and breed characteristics for a “Blue Point Himalayan Cat”. The information helped but of course each pet is an individual and has his or her own special looks as we all do. The pictures along with the information I had and most importantly my clients comments and our critiques together brought out Madison Blue’s own look and personality. The Original Pastel Painting measured 12″ X 16″. This was an unusual painting since my client and I love the natural color texture of the heavy cotton paper we decided to not paint the background instead, I had to work very carefully to paint only Madison and keep the background absolutely clean. 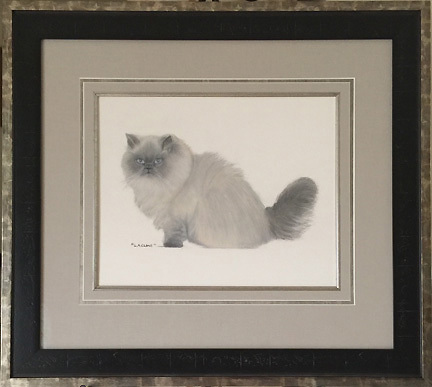 The finished pastel portrait painting framed was about 26″X 30″.